You know how when you have a baby, things change all the time? You just get waketime length figured out and then BAM! Time to drop a nap. These moments help train you for what parenting brings all along the way. Just when you get a great chore system in place, BAM! Your child enters school and you aren’t sure how to work chores in anymore. Here are some tips to work past that. The culture I grew up and and currently live in is one that values work. My father is the son of a dairy farmer. They worked hard. Because of the example of my parents, I am a hard worker. I always knew that I would want to teach my children to be hard workers as well. I spent many hours during the first several years of my oldest child’s life reading and reading about chores–developing my own opinion and philosphy as I poured through countless “expert” opinions. We worked on chores in our home and had a great system going. 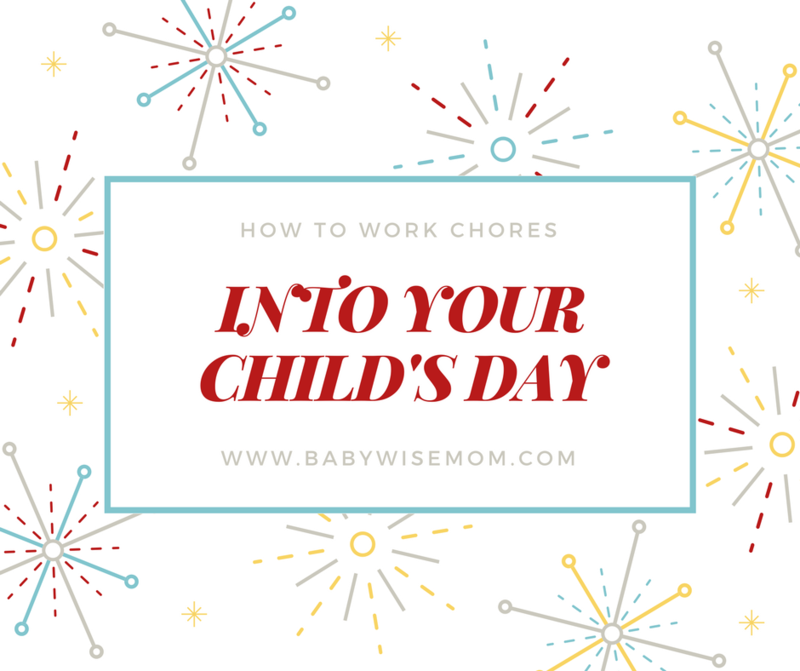 Organizing and implementing chores was and is easy if I am home and my children are home all day every day (for the most part). When you are all home, you have an entire day to fill. Chores are almost necessary just to keep the masses sane. You need to balance the structure with the the free play. But when we started adding school, lessons, sports, etc. to life, it became a little trickier. I would imagine much of my dilema with it all is similar to what many of you readers experience as your children become school age or you go back to work. I have a hard time knowing where to fit chores into our day. I can think of times that work on paper, but fitting it in real life is something that pulls at me. Here are some ideas. We could do chores each morning before school starts. My children typically have about an hour they can spend playing with each other before school starts. An hours is plenty of time to work chores in. But…I have a hard time with the idea of chores before school. My three older children are about to go to a day highly full of structure–I love that they can spend some time just letting their imaginations take over before they head off to school. My fourth child (3) has this precious hour to play with siblings before she is left in the house with me for the day, so I hate to have her play time spent doing chores. On the other side, after school, we have the same issue. They just spent the day at school and away from family. I don’t want to then greet them with, “Hey! Time to work!” Plus they have homework and activities that take time after school. Another option is to load a bunch of chores onto Saturday. Saturday can be our work day. But do I really want to turn the one day of the week we have off into chore day? With all of all of options…it almost seems easier to just forget the chore thing! The reality, however, is that I am still a big believer in the benefits of chores. I believe that work has more than an economic value (Work: More than Economic Value). 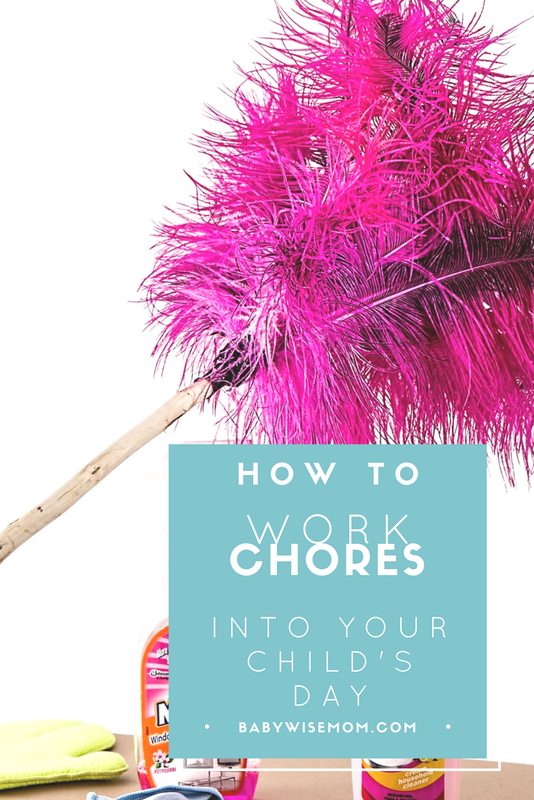 Most of us who have had our children help with work around the house know full well having the child help with chores does not make things easier (at least initially–since I have children who are 10-3 I can promise you the day does come that they do actually add quite a bit of help as they get older). Work is a necessary part of life, and I even believe work is good for us (see Work and Responsibility). I want my children to leave my home self-sufficient. I want them to be able to do their own laundry, clean their bathrooms, and make food for themselves. I want my son to be the type of man is is able and willing to help clean around the house. I want my daughters to be able to keep their homes clean. Their is value and satisfaction in work. If all work and no play makes Johnny dull, then all play and no work makes Suzie pretty intolerable. I deeply believe all of this, and yet the decision is hard on when to best work chores into our lives when school is in session. When I first faced this problem, I realized the root of problem here was that I hadn’t ever changed my strategy. I was trying to apply my previous plan on a new situation, and that doesn’t always work. A new life situation will likely mean a restructure in the chores plan. So how do you figure out the best time for chores to work in your home? Write down on paper the possible times you can do chores. You want to choose times that are consistent each day–times you know you can follow through on. Think through your options–visualize each scenario in your mind. Follow it from beginning to end. Does it seem to work? Think through the possible reasons that time doesn’t work for you. If you can’t resolve your “nay” reasons, that likely will not be a successful time for you to have chores. Choose the time you think will work best and implement it. A great idea is to work some chores into certain routines that happen each day. For example, making your bed can be part of your morning routine. You can have a routine where each person clears his or her own place after each meal. Each evening, we clean up all of the toys that have been played with that day as part of our bedtime routine. There are many small things you can make part of the routine of the day. Be willing to change your strategy if the one you picked is not working after a time. There is nothing wrong with changing things up if what you are doing is not optimal. So what do we do? We actually have a combination of the options. I encourage the children to get chores done before school. If the chores were not finished before school, then they must finish them after school before free play. Anything not done during the week will mean it has to be finished up on Saturday. The children all prefer working toward getting all chores done before school. 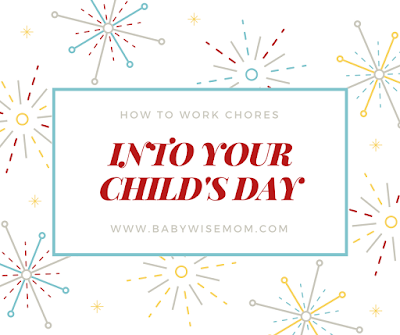 For much more on chores, see all of my chores posts here: Chronicles of a Babywise Mom Chores Index.